[Although its 2017, I first heard of the "Iran problem” from a Jewish "pal” of mine in Jerusalem in 2008. Back then, being a fool and believing the lying Jews, I posted many articles about it. I was assured that if something was not done about Iran that by 2012 Israel and Iran would be involved in a war – a nuclear war I think – was the threat by the Jews. So this business of Iran is actually pretty old. When I awoke to the Jewish problem in 2012 due to other things, I realised this is just more nonsense from them. It is true Israel wants to take Iran down but the Jews as usual are too lazy to deal with their own problems so they try to drag others in. The USA is to modern Jewry what Britain used to be. I have no doubt that the Jews want to start WW3 and they especially want to see the USA thrown into the thick of things. They are filth – as they have always been. Lasha Darkmoon ran this abridged version of an article written by someone else. The topic of the Middle East is complex. At the time of the “Cold War” the Soviets backed the Arabs against Israel/USA. Syria and Iran are thus “clients” of Russia and Russia has a DEEP HATRED of the USA. I knew a businessman who went to Russia and met their generals for a deal. He told me the Russian military have a DEEP HATRED for the USA. We could also see it here in Africa where the Soviets and Chinese sponsored the blacks who fought us. It has indeed astounded the Jews that Syria is managing to survive despite everything. From what I heard, Iran is pretty backward in many things, but a Jew pal I had in Israel told me that Iran is almost invincible. This is the real reason even the USA stays out of Iran. — Dr Mahathir Mohamad, former Prime Minister of Malaysia. — Bring down a strong secular Arab state [Syr[Syria]ng with its political structure, armed forces and security services. — Create total chaos and horror in Syria, justifying the creation of a “security zone” by Israel not only in the Golan, but further north. — Trigger a civil war in Lebanon by unleashing the Takfiri crazies against Hezbollah. — Let the Takfiris and Hezbollah bleed each other to death, then create a “security zone”, but this time in Lebanon. — Prevent the creation of a Shia axis Iran-Iraq-Syria-Lebanon. — Breakup Syria along ethnic and religious lines. — Create a Kurdistan which could then be used against Turkey, Syria, Iraq and Iran. 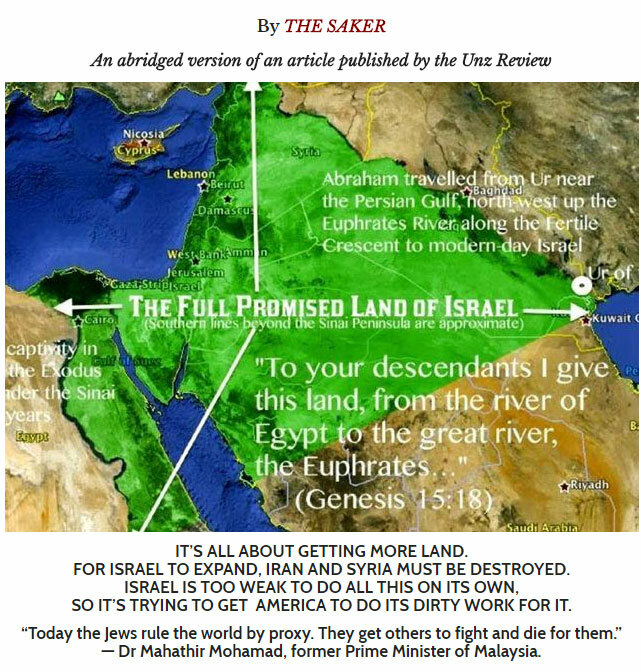 — Make it possible for Israel to become the uncontested power broker in the Middle-East and force Saudi Arabia, Qatar, Oman, Kuwait and all others to have to go to Israel for any gas or oil pipeline project. — Gradually isolate, threaten, subvert and eventually attack Iran with a wide regional coalition of forces. — Eliminate all center of Shia power in the Middle-East. To say that the Israelis are seething with rage and in a state of total panic would be an understatement. — The Syrian state has survived and its armed and security forces are now far more capable than they were before the war started. — Not only is Syria stronger, but the Iranians and Hezbollah are all over the country now which is driving the Israelis into a state of panic and rage. — Lebanon is rock solid, even the latest Saudi attempt to kidnap Hariri is backfiring. — Syria will remain undivided and Kurdistan is not happening. Millions of displaced refugees are returning home. — Israel and the US look like total idiots and, even worse, as losers with no credibility left. The Israeli record of completely illegal military interventions is so long that we can safely assume that the Israelis will be involved in *any* ugly or evil plan to lay the region to waste. The main problem for the Saudis and the Israelis is that they have bad armies. Their problem is that their only true area of expertise is massacring defenseless civilians. They are real experts at. But in terms of real warfare, especially against truly formidable adversaries like the Iranians or Hezbollah, the “ZioWahabis” (what a combo!) don’t stand a chance. And they know it, even if they never admit it. Imagine how frustrating that must be: you basically control the US which you have turned into a vassal-state, you spent billions and billions of dollars in equipping and training your bloated armed forces, but at the end of the day the Shias are just laughing in your face. And, for some reason you cannot fathom, every time you try to “teach them a lesson”, it is you who has to crawl back home in total shame to lick our wounds and try to hush up the magnitude of your defeat. That hurts, badly. So a plan to make the Shias pay for it had to be concocted. Here is what I think it will be. I have written many articles explaining that the US military does not have the means to win a war against Iran. And that might be the problem here: the US commanders know full well that and they are therefore doing whatever it takes to tell the Neocons “can’t do, so sorry!” (that is the only reason why a US attack on Iran has not happened yet). From an Israeli point of view, this is totally unacceptable and the solution is simple: simple force the US into a war they really don’t want. After all, who cares how many US goyim will die? As for the Iranians, the goal of a Israeli-triggered US attack on Iran would not be to defeat Iran, but only to hurt it. Very very badly. That is the real goal. As far as the Israelis are concerned, not only don’t they give a damn about how many non-Jews will die (Judaic ethics teach that all non-Jews are most likely deserving to die anyway) as long as their Master Race benefits from it. Simply put: to them we are only tools, tools capable of thought, but tools nonetheless. That is also how Neocons view us, of course. In fact, I can just about imagine the glee of the Israelis seeing that the Shia and Sunni Muslims are killing each other. Throwing in a few Christians only makes it even better. The Israelis are now offering to share “intelligence” with the Saudis. How touching it is to see these two medieval, backward and generally evil regimes so willing to work together. At least they are both now showing their true, ugly, faces! Needless to say, if the Anglo-Zionist Empire joins in and unleashes its full military might against Iran, something which I consider a very real possibility, then all bets are off and Iran should, and will, retaliate with a full set of symmetrical and asymmetrical responses, including strikes against Israel and the Saudis, and even strikes against CENTCOM bases in the entire region. However, such a situation would have catastrophic consequences for Iran and should therefore be avoided if at all possible. At the end of the day the best hope the world has is that a US American patriot will see through this rather obvious plot to “wag the dog” and tell the ZioWahabis “not on my watch” like Admiral Fallon did in 2007 (will that honorable man ever get the historical recognition he deserves, say a Nobel Peace Prize? Possibly never in this world, but in the judgment of God he shall be called a “son of God” (Matt 5:9)). By themselves the Israelis and the Saudis are just a gang of medieval thugs which even Hezbollah can terrify and force to run. Their only real power is the power they have in Congress and the US Ziomedia: the power of corruption, the ability to lie, deceive and betray. I know for a fact that there are many US officers on all levels in the US armed forces which see straight through these Zionist smokescreens and whose loyalty is to the United States and NOT to the nasty little Zionist Entity in Palestine. Finally, I have not lost all hope that Trump could do the right thing. Yes, he is a weak man, yes, he is now cornered and has no allies left, but when faced with the horrendous consequences of an attack on Iran he still might say “NO!” and order his staff to come up with some other plan. Trump might also realize that refusing to wage war on Iran would be his best revenge against those who have smeared him and who are now apparently trying to impeach him. At this moment in time it is pretty clear that an attack on Iran is being prepared and that such an attack is possible and even likely. Jan?? the video isn’t here. On an unrelated topic, what do you look like?